Koni SRT.T Front Struts – The First Individual Struts For 2011+ Mustangs! It’s no secret that the Ford Mustang has never been the best handling car on the market. However, installing a set of Lowering Springs is one of the most popular modifications that a Mustang enthusiast will do! This definitely helps in a few different departments. However, the Struts have always stayed a weak point on the 2011+ Mustang suspension with the lack of options out there. O ur friends at Koni have brought the Mustang community the first individual strut option for all 2011+ Mustangs with the Koni STR.T! This is a perfect Modification if you’re looking to upgrade your old warn out front Struts or if you’re installing a set of Lowering Springs and are looking to overhaul more areas of your Suspension! 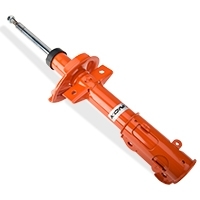 Koni is a premier manufacture for Adjustable Shocks and Struts. Their main focus is taking your Mustangs Suspension to the next level of Performance and Comfort. All of their products are backed up by a limited lifetime warranty!